Anti-aging cream Inherent Beauty Revitalizing Serum (aka Aluris, aka Suisse, aka Magic Face Therapy, aka Premiera Matrixyl, aka Dermaliere) and its eye counterpart HR-Cream (aka Nova Derm Eye Cream) are both flat-out scams, and in this short review I’m going to expose these viral products for what they really are. I’ll be talking about these products in the same review because they come from the same scammers … even though they are trying to give the impression that they are separate, unrelated companies! Before going further, let’s find out who is behind these products, shall we? Inherent Beauty LLC Does NOT Exist! Inherent Beauty Revitalizing Serum is owned by a company that calls itself ‘Inherent Beauty LLC.’ Well search for this company, and you’ll soon discover that there is absolutely NO information about it. There is not even a physical address proving that the company has a building! All you’ll ever find is a phone number, P.O Box address and an email address. I went a step further by trying to find out who registered the Inherent Beauty Revitalizing Serum website. After checking the Who.is data of the website, I found out that the name and address of the registrant is hidden using a proxy service. So there is absolutely no way of finding out the location of this company. What this means is that we are dealing with a ghost company … which is a really serious red flag! HR-Cream LLC Does NOT Exist! This one is easy. Check the HR-Cream website, and you won’t find any physical address we can use to verify that it is really a company. On top of that, we don’t know who registered the company’s domain since it was hidden with the same proxy service used to hide scams like The 3-Week Diet, ED Miracle, Red Smoothie Detox Factor, etc. The scammers behind this product pasted a list of ingredients on the ‘Product Info’ section of the website. However, they failed to tell us which ones are the active ingredients, leaving us to make wild guesses. Besides, there is no information on any of the ingredients listed and their possible side effects. Just like Inherent Beauty Revitalizing Serum, the scammers pasted a list of ingredients on the ‘Product Info’ section of the website. Again, they fail to tell us which ones are the active ingredients. There is no label to tell us the composition of these ingredients, their functions and their possible side effects. If you happen to visit the Inherent Beauty Revitalizing Serum website for the first time, the first impression you’ll have is that it is just a free trial. Unfortunately, that’s not the case! Read the Terms and Conditions, and you’ll discover that the ‘free trial’ costs $4.95 for a 30-day supply. After the 14-day trial period has expired, you’ll automatically be charged $89.85 per 30-day supply. In addition to that, you’ll be enrolled into an auto-ship program if you don’t cancel your trial within the period allowed (14 days). This means that your credit/debit card will be charged $89.85 every month. If you want to cancel your trial and/or subscription, you can reach them by calling 888-239-5985. 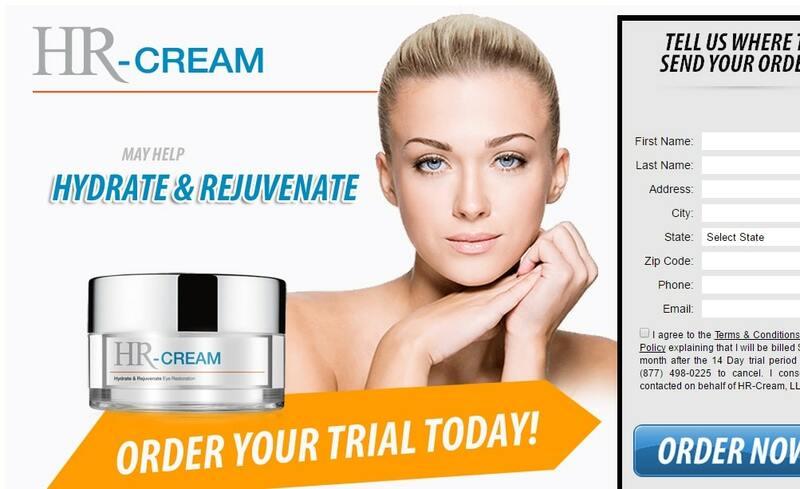 Pricing for HR-Cream is almost the same with Inherent Beauty Revitalizing serum. In the Terms and Conditions page, you are told that you’ll pay $4.95 for a 30-day supply. After the ’10 Day + 4 Day shipping trial’ has expired, you’ll be charged a monthly bill of $88.78 if you don’t cancel. You’ll also be automatically enrolled into an auto-ship program. I have browsed through many user reviews about HR-Cream and Inherent Beauty Revitalizing Serum, and almost 100% of them are dissatisfied with them. Many of these users reported suffering allergic reactions while using the products, while a greater number complained bitterly about the very poor customer service. I’ve not seen a single customer review saying that the products work as advertised. Inherent Beauty Revitalizing Serum: A Multi-Website Scam! There is a disturbing thing I discovered about Inherent Beauty Revitalizing Serum: It is being marketed on several websites with different names! Above, I listed the older aliases of this product. As you’ll soon discover, the websites design are basically the same and most of them contain the same product description. Some of the websites are now either unreachable or country-restricted. This basically means that we are dealing with a ‘Hydra-like’ scam – cut off one head, and another grows back in its place! Final Conclusion: We are Dealing With A Multi-Website SCAM! I believe that there are more clone websites like these. So if you happen to come across a new clone, please alert me in the comments section so that they will be added to the list. Thank you! Christy is the creator of the skin line. so it only makes sense for that to show up as the caller id. We’re you within the 14 day period? What are the numbers to call. I have been searching the internet. Everything written applies to me also. These people should be ashamed of themselves. Can they be that needy for money? The product is crap. Broke my skin out…not a good thing at 70 years old to have acne! I just can’t believe the audacity of the people on the phone. I eventually got a 50% refund. So, they made nearly a $100 bucks. How often does that happen? Wouldn’t take too long to pay for those phone lines and still walk with a profit. So much for just paying shipping fees for these two.products. finesse and HR cream they automatically bill you and wont accept them back. I have owned my own business for 38 years and you certainly get nowhere scamming customers. What’s interesting to me is I have very sensitive skin and this is the only thing I’ve found that works for me as a moisturizer. It was something in my mom’s supply. She let me take it from her and gave me the card so I could order my own. I was doing this research before I ordered. I’m a bit sad, not because of the sales model – that’s nothing unusual, Not because of the “works as advertised” – who knows, probably not, I don’t care–my face is moist and not breaking out-yipee and it doesn’t appear to have sunscreen in it because its not a moisturizer – super yipee, I hate sunscreen in my face cream… but I’m sad because of all the bad reviews. I finally found something I like and here is all “this”… sigh…. I ordered the free samples of HR cream and paid $5 shipping. Another $89 was taken out of my account. I was told I had 14 days to cancel before being charged. I read it was free. Conveniently, my order arrived after the 14 days. Total rippoff. I’m filing a complaint with the Federal Trade Commission. I hope everyone who was ripped off on here does the same so we can get to the bottom of this scam. could you please post a link to join in on the complaint? really….should file class action ! I am in hte middle of this hassle. too. So far they have charged me $281.69. THis Cassie I spoke to today said she IS a SIUPERVISOR and because I disputed the original charges with my credit card company, they could not do anything about this subsequect shipemnt that they sent me. Even though she says she has record of my call on APril 25th to cacnel the first set of shipments that I had NO IDEA i was getting charged 89.95 for. Its so ridiculous they can get away with this. Scam! These people have charged all sorts of items to my credit card! Never received any of it. Had to cancel my card and file disputes with Visa! I called the customer service department back and flat told them they are scamming people and putting charges on their credit cards without permission! They charged my card for a Russian cream for 99.95!!!! OMG- read these reviews, they are so true. This company is a SCAM. Try to cancel and return….it is VERY difficult. If you ask for their mailing address…they refuse…..a sign they are not legitimate. They start quoting legal terms to you and reading the fine print that must be on their website somewhere. Not a business you want to work with. As for their product, I am going to guess that it is overpriced and does not work because they need to sell it with their sneaky and deceptive mail order practices. Any truly legitimate company wouldnt sell their products this way. My 4.95 trial came from a new face (inherent) treatment discovered on Shark Tank. I,too, had an option to buy another cream that I thought was part of the original offering. The other cream is called YS-cream. I have not tried them. I was charged 89.00 a piece. Yikes! What is this all about. I called the one and got a refund for inherent. The other cream, (ys)they will not refund, saying,I agreed to terms and conditions. I didn’t see any on the site I was on. I looked for it, because I didn’t want to be stuck with a big bill each month. Talking to my credit company. I fell for it too and got the same line from both of the numbers I had to call ” we only show one product shipped”. I should have known better. Inherent Beauty after saying CANCEL to each of their “better /discounted” offers finally agreed to refund 30% of my $90 charge but no more. The YS Cream company(which I did not order but came with the other stuff) refused to refund anything because I did not cancel in time! So mad, at myself for being suckered! They will have to answer to God for their theft & deception. I have been a victim of their scam. They charged me 4.95 at first and later they charge me two transactions of 88.78 and 89.87 on my credit card. I never used or even open their items, since, I am afraid they might be toxic to skin. I supposed to be a ‘free 14 days trial with 4>95 shipping only”. I don’t know how many times, They will keep charging my credit card now. Call them and cancel them. Your bank will have the phone numbers for each product. And, you can also open a new bank account and have everything carried over. You guys have to understand that it says right in the Terms that you are going to be billed and enrolled in an auto-ship program, and all you have to do is call to cancel. When first ordering I intentionally looked for the Terms & Conditions because I was afraid it may be that type of scam. Never once is there a mention of recurring fees or that the item needs to be mailed back in 14 days. Nor was there any mention of additional fees on the confirmation emails. Am calling my credit card company now. I didn’t think I saw that it was a trial that needed to be sent back. I had 2 charges in Feb for $44 and change and $45 and change. They said that I didn’t have the money in my account so they only charged me 50%. The last one – one charged $89.84 under the name of Finish Line Auto!!!!! The other one is under TDE*Revitalizing. I canceled both products, but I NEED my money back. I’ve already called my bank and they are sending me paperwork to complete. Someone on here said they were filing a complaint with the federal trade commission. Have you done that? Have you heard anything back? And lastly what is their website? Same here. I ordered thru Facebook and it Never showed any of that! I looked carefully at ti too, and never saw anthing like that, but I should have known better. THeir customer service is horrbile., Even though I tried to caencel it and they show record of my call in April, THey still sent me another bottle and charged me another 89.95, and refuse to work with me because I filed a dispute on the first charges. I was able to cancel any future charges they would make on those names, Pshskincare, and glinting skin care, but if htey change the name of what they are chrging under, there is nothing they can do , but try and dispute and chase that down. Its crazy. I fell for the same scam as it was on Facebook and supposedly was a product on Shark Tank – I guess they can use any one to say how wonderful the product was. Anyway I will get my 14 day supply and then call and say NO MORE. I wondered what was going on when I went back to the first ad and clicked on that to order and it took me to a product called ILLUM which had the same people and faces on it. Then I knew this was a scam. Lets hope I can get out of it too. They got me. I wish that I knew about this website before signing up for a sample.. $179.00 ago! Gave me hives and attacked my sinuses. Small claims court, here I go. I called and Joslin hung up on me after I kept telling her I wanted a refund for the $200 that they illegaly took out of my account! She also kept refusing to let me speak to a supervisor or give me their name! When I ordered thru Facebook, it never said anything about 14 days and $89 for each product! It’s stealing! I was scammed as well! I want my $89.00 back! They put me on auto ship that I did not ask for and won’t take my return or refund my money. Didn’t care for the first bottle and didn’t want another. I also fell for this scam. When I saw one charge for $89.95 I was pissed. Then a couple of smaller charges then another for $89.85 from another company. I managed to get hold of the second company by email & had my money returned. Disputed the other smaller charges with my bank & had those returned. I was out of luck on first charge as that was beyond two weeks. Cancelled my card so they couldn’t charge any thing else.